Spotlight Blog | Multiples and More! This week I interviewed Lani Lyons from Multiples and More, a blog designed especially for parents of multiples to network and connect. Scroll down for my exclusive interview with Lani. Lani: I’m originally from N.Y., but have lived in Florida for 11 years. Lani: Like most people, I began blogging as a way to keep my out-of-state family and friends up date date on what is going on with my kids, but it has turned into so much more. I have 20-month old triplets, and I have made many connections with other multiples moms and learned so much as a result. 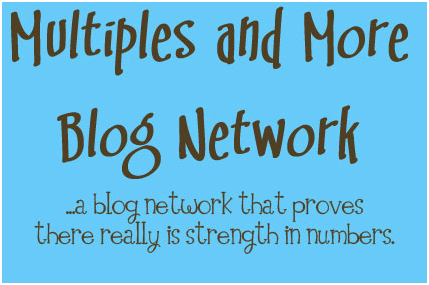 Lani: I have two blogs: Triplets: Who Knew?, which is about my family and our (mis)adventures, and a network blog that I began about 4 months ago with a fellow multiples mom: Multiples and More. Multiples and More is dedicated to providing support and information to families with multiples. We have a daily format which includes expert interviews, featured bloggers, product reviews, giveaways and guest bloggers. We keep a list of our members’ blogs in our sidebar so that fellow multiples families can easily find one another. Lani: We would like to create the ultimate online community of blogging families of multiples. Kind of a “virtual” moms of multiples group where people can meet others multiples families with kids of similar ages, get useful information on parenting multiples, and have fun with our contests and giveaways too. Lani: I know that “meeting” other multiples families online has helped me immensely with raising my triplets, and that’s the kind of support that I’d like to see our readers benefit from as well. Lani: We provide helpful information, interesting interviews, and lots of giveaways! Lani: Be honest and be yourself in your blog. You can visit Lani at Multiples and More. Blog Awards | I am Honored! I always enjoy Lani's blog and I totally love the MoM's site that she started!!! Great interview!